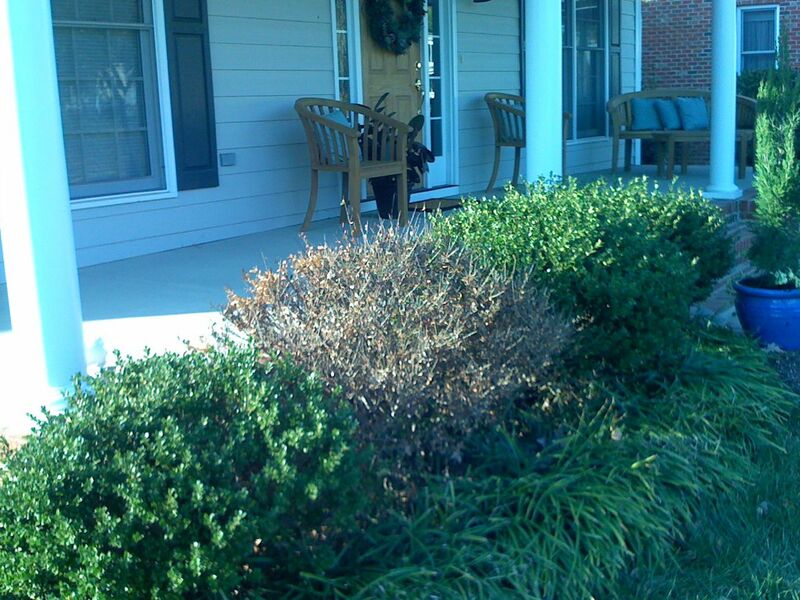 At my favorite garden center yesterday it was impossible to pass up a new Japanese Holly variety, Ilex crenatea ‘Drops of Gold.’ I brought it home planning to put it in a large blue pot near the front walk during fall and winter, but eventually decided to add it to the foundation planting in front of the house. 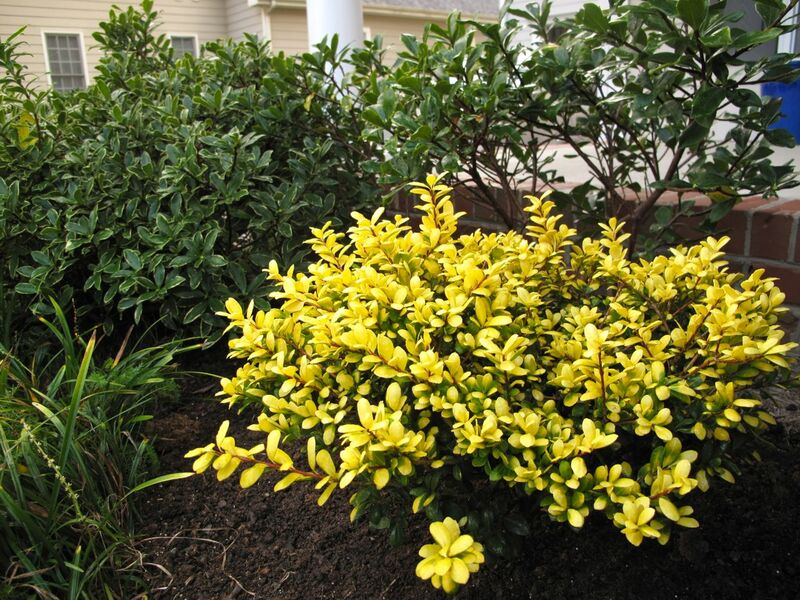 ‘Drops of Gold’ is a small shrub that will reach 3-4 feet tall by 3 feet wide. When I first saw it I thought it was in flower, but actually the color comes from the leaves. Here in this microcosm of suburbia, the house’s original landscaper lined up 9 or 10 Ilex crenata (Japanese Holly) shrubs across the front of the house. That was fine until 5 of them died during a severe drought a few years ago and replacements died the next year. The demise of one is captured in this old photograph. The hedge never fully recovered and some noticeable gaps remain, although three Daphne odora ‘Aureo-marginata’ were added several years ago that have done well. They provide some foliage variation and perfume the air when blooming, but they never grew as large as expected to fill in the open spaces. 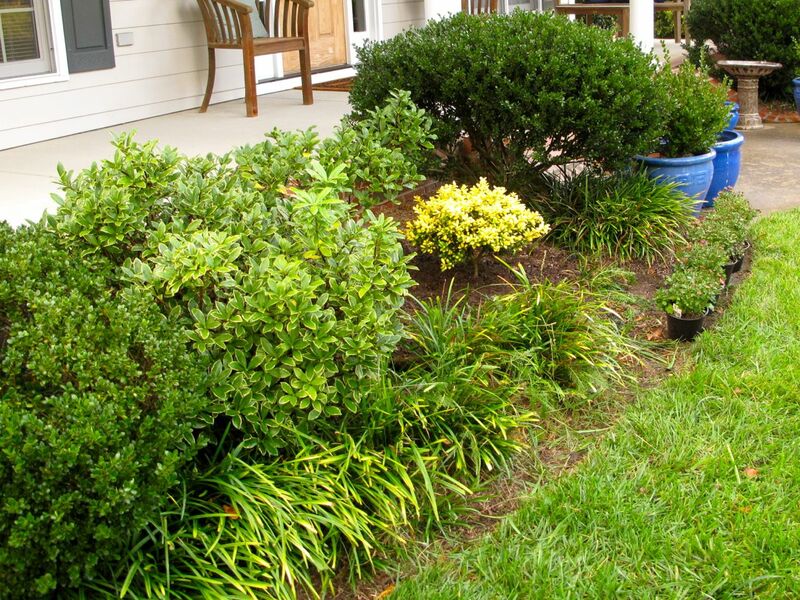 Whether it makes sense to plant another Japanese Holly here is debatable, but here it is. After many years of ignoring and/or hiding the gap with a pot of chrysanthemums or geraniums, if I can keep ‘Drops of Gold’ watered, perhaps this section will improve. I have very selective vision and will continue to ignore the Liriope. 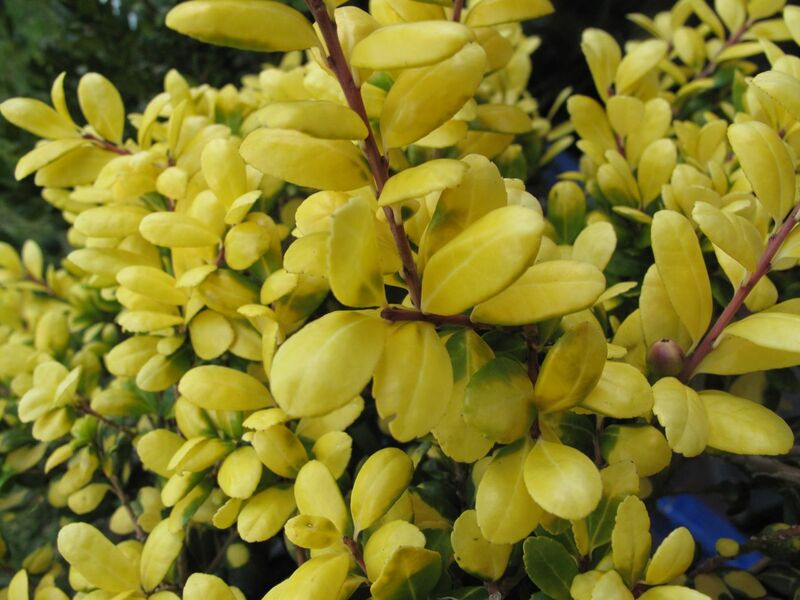 This entry was posted in garden and tagged Ilex crenatea 'Drops of Gold' (Japanese Holly), nature photography, photographing nature on October 19, 2012 by pbmgarden. 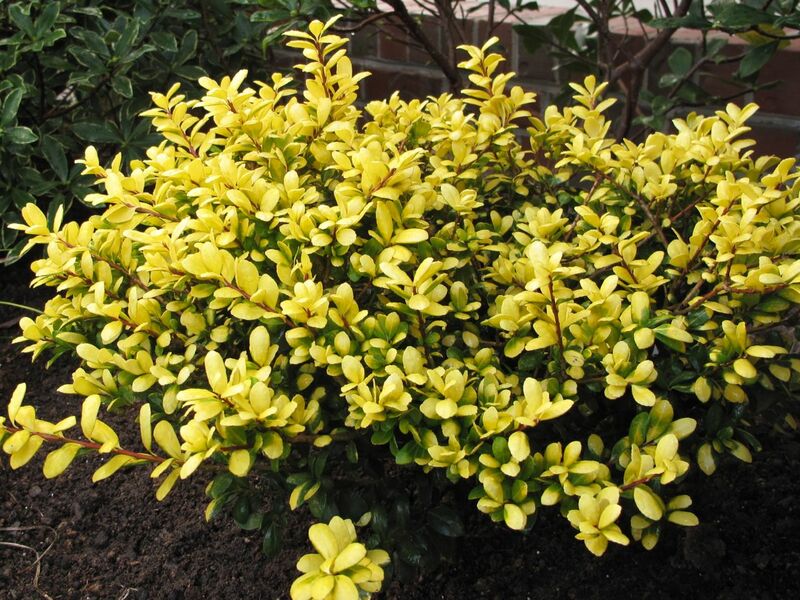 What a beautiful little shrub, just like a splash of sunshine all the year round. Hope your plant is happy in its new home! Thanks Pauline. I do hope it will be happy too! A lovely colour and a lovely spot for it where it can draw attention to itself among the surrounding greens. Hope it settles in well! Thanks Cathy! It will be interesting to see how well it works out there. Yes, hope it will retain the color. The tag indicates it will be brighter in spring! I think so too–hope it will retain that color. That makes good sense. Thanks Christina! I am going to put this plant on my shopping list. I love yellow in the garden and this ‘Drop of Gold’ is great. Hope it lights up your life! This plant actually didn’t do well as it turns out. I planted it in Oct 2012 and it looked so promising, but failed to thrive. Maybe I had it in the wrong location but I noticed a neighbor’s down the street disappeared too.